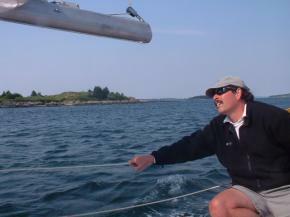 My friend Dan (see here guiding us through the boat moorage in Rockland Harbor) bought a 30' Catalina, Destiny, last winter and it came with a mooring in Rockland Harbor- gateway to Penobscot Bay. We have been plotting this trip ever since! I think the anticipation was every bit as much fun as the trip itself. Dan drove us up Wed. 07/10. 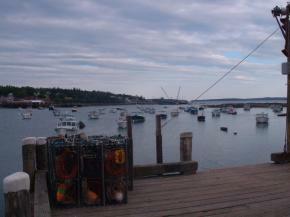 We pulled into Rockland, ME around 4:30 and did some shopping. I had already got a 30 pack of beer, so that detail was all set! 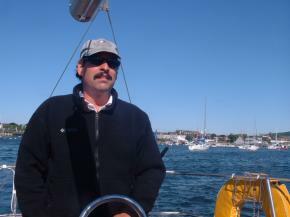 I have only seen Rockland Harbor in the winter when we come up to stay at the Samoset Resort right on the harbor. Seeing it now in the middle of the high summer season just took my breath away! 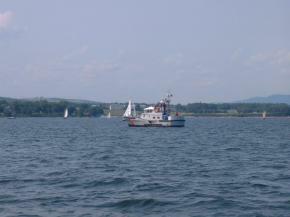 And to top it off, this week and weekend was the annual Rockland Wooden Boat Show. There were literally hundreds of sailing boats of all kinds everywhere! I can't tell you how many enjoyable hours the two days at each end of our trip that we were on the hook in Rockland Harbor that I sat transfixed in Destiny's cockpit just watching the fleet go by. It was just a breathtaking experience! And I was center stage for the whole show! I just sat back in that cockpit with my beer and relaxed. It took me all of 42 seconds to forget everything! While Dan went ashore to run a couple of errands, I took in the harbor sights from my water vantage point and read through a copy of Points East magazine. 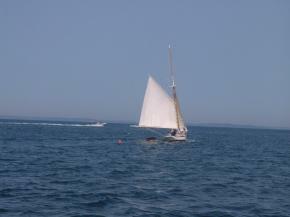 Though flexible, our original plan was to spend the night in Rockland Harbor and then sail over to Hurricane Sound at the Southwestern tip of Vinalhaven, the Southern of the two Fox Islands; the other being North Haven. So, we settled into the cockpit for a few beers before heading ashore to find some dinner. I almost got whiplash trying to keep up with all of the passing boats! We took the dingy into shore about 9pm and drove up to Camden. Dan wanted to go to the Sea Dog for dinner as he wanted to see the manager about setting up a date for him to play there. Dan is a singer/songwritter disguised as a technical recruiter during the day. I've been to the Sea Dog before and have always had a good time. So, we had a couple of beers and dinner, Dan got a date to play, and we enjoyed our visit. The last time I had been to the Sea Dog we had a spectacular view of the nearby backlit waterfalls tumbling over frozen rocks. We hopped back into the car and returned to Rockland. 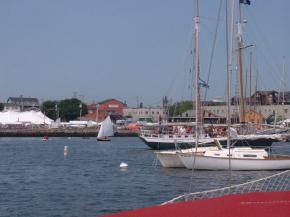 We had to park quite a distance from the Harbor due to the Wooden Boat festival. Feeling drained after that hike, we wandered into the Time Out Pub, a local pub right off the harbor. Loud music, a real party crowd, and cold beer were just what a couple of wayward sailors were looking for! Weakend by the gross quantities of consumed beer, I agreed to play darts with Dan. I never play darts. I can shoot a gun but I can't hit a dart board to save my life. Dan was counting on that. But either he was drunk and couldn't hit, or I was drunk and could. Whatever it was: I won! 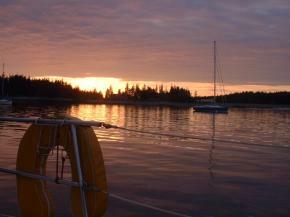 We staggered back to the dock, motored back to Destiny, and called it a night. 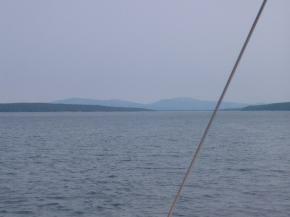 We were pumped about sailing out into Penobscot Bay in the morning. We got up Thursday morning of the 11th to a very brisk wind out of the Southeast. We sailed out past the Rockland Breakwater lighthouse — that we always walk out to when we are visiting the Samoset — and into Penobscot Bay. As we left Rockland Harbor, we tried beating into the wind toward Hurricane Sound for awhile but realized that it would be a long haul. 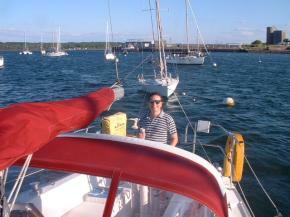 We swung the bow "d'n east" and pointed toward North Haven and Pulpit Harbor. We charged through the slight chop on a nice reach under jenney and main. We had planned on getting around to the other side of the Fox Islands after exploring Hurricane Sound, so our new heading would simply take us around from the North instead. Pulpit Harbor is a lovely area, as you can see from the two pictures I took: one looking in at the entrance, and the other looking North into the main anchorage. 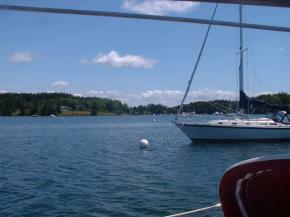 We had thought that we would stop and have lunch in Pulpit Harbor, but we had made such good time that we decided to just swing around and continue on our journey around the Northern tip of North Haven. Until we got aways around we really didn't know where we were going to head. But again, because we were making such good time, Dan suggested that we continue on a North to Northeast heading for the top end of Eggemoggin Reach. I had read a lot about the Reach, but had never been there. We would cross Jerico Bay and have to navigate thorough a series of small islands, but the sky was clear, the wind was fresh, and the players were game! It is very difficult to determine ones location by spotting islands and trying to compare them to what is shown on the chart. 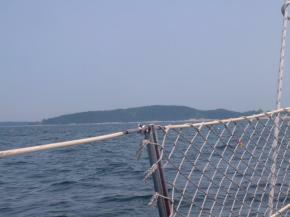 We inadvertantly missed identifying Compass Island and ended up further Northeast than we thought at Resolution Island. That proved to be fine because no matter which of the islands we turned at, as we could just swing East toward the top of the Reach. The boat traffic was beautiful, as you can see from the following two pictures. 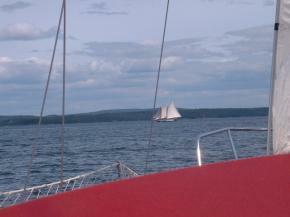 These two schooners were both heading toward the Reach: one ahead of us, and the other tacking into position behind us. The entrance to Eggemoggin Reach is wide and well marked. 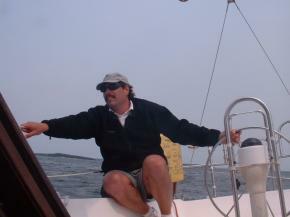 The wind was howling at times, and in one wild tack I lost my C&S Self Defense Association ballcap overboard. We beat back and forth around the area of the Reach's main channel marker in the chop looking for it, but there was no finding it in the confused foot and a half swells. 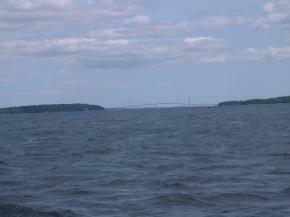 As we rounded the main channel marker falling onto almost a dead run, we could see the mid reach bridge in the distance. What a sight! Rather than pulling over and wasting time dropping the hook, we opted to keep sailing and eat on the move. The breeze remained quite fresh and Destiny surged through the cold waters of the Reach. 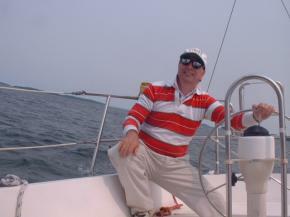 It was a spectacular sail which we both thoroughly enjoyed. 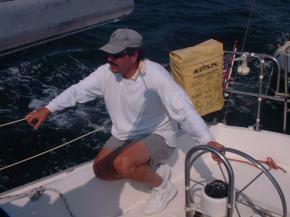 Dan went below and fixed himself a sandwich and came back up on deck to eat while I steered. Then we swapped positions and I ate as we approaced the bridge span. I finished just before we came upon this Coast Guard patrol boat. We had seen a couple of Coast Guard vessels in Rockland Harbor, which was normal because there is a major Coast Guard facility at the Southern end of the harbor. 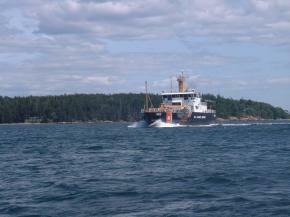 But we constantly ran across Coast Guard and marine patrol vessels in our cruising. The bottom of Eggemoggin Reach empties out into Blue Hill Bay. Blue Hill Bay borders Mt. Desert Island to the West and Frenchman's Bay borders it to the East. 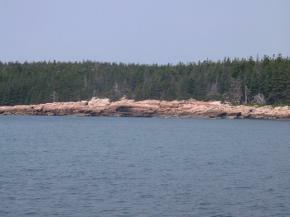 We decided to head for Bass Harbor at the Southwestern tip of Mt. Desert for the night. As we exited Eggemoggin Reach, we hardend sheets just a bit and bore off for Mt. Desert. 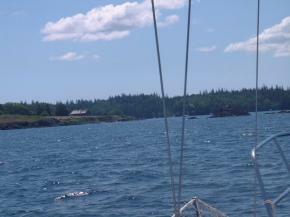 We had a nice easy sail across Blue Hill Bay to the mouth of Bass Harbor, home port to Mt. Desert's largest fleet of lobster boats. It was about 7:00 as we entered the harbor. We had read that there were a couple of resturants on the harbor, and so figured we would tie up at the town dock and explore for a place to get dinner ashore. The picture on the left above is a view looking into the harbor. 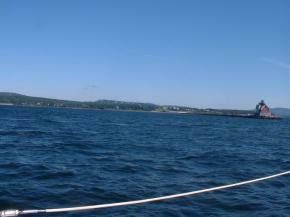 We ended up dropping the hook for the night in a little cove to the left of the entrance to the main harbor. 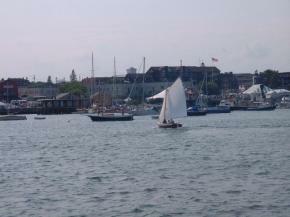 The first buildings on the right are the famous Morris Boats, builders of fine sailing yachts. Following that is the town landing which was undergoing major construction. 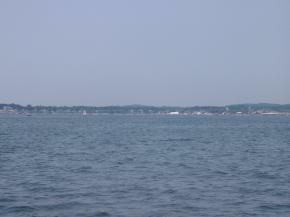 The picture on the right is a view from the fishermans pier looking back out into Blue Hill Bay. Due to the construction going on at the town dock, we motored over to the fishermans pier- directed there by a couple sailing the harbor in a small daysailor. The picture on the left shows Dan consulting Taft's "A Cruising Guide To The Maine Coast" for something to do as we didn't see much happening anywhere, though the folks from the power boat next to us on the dock walked over to one of the resturants for dinner. 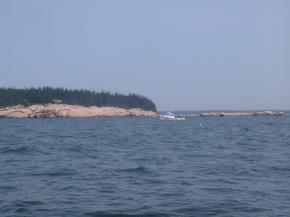 We decided to just head back out to the mouth of the harbor and drop the hook in that cove I mentioned. We fixed up a terrific spaghetti dinner washed down with copious amounts of cold beer and watched the sun set. Beautiful. Just beautiful. The picture hardly does it justice. We really had not planned on covering so much distance in just one day, and here we were all the way over on Blue Hill Bay! One of our "goals" for the trip was to see Eggemoggin Reach and Blue Hill Bay and we figured we would chew through the better part of 2 days to do so. Over a light breakfast of health food donuts (...yeah, right!) we mulled over our options. Though the weather forecast was good, there was a possibility of thunderstorms brewing for Saturday afternoon. We could press on around the tip of Mt. 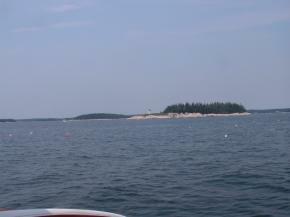 Dessert Island and head further "Down East" and take a chance on getting caught pretty far from home in a storm, or we could head back to Penobscot Bay and gunkhole around there. 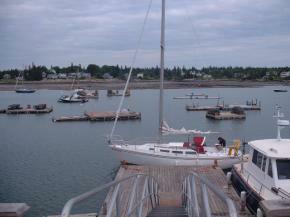 We decided on heading back to Rockland Harbor. We figured it would take us most of the day. We could then and wander around the Wooden Boat Show and catch dinner ashore, and then daysail Saturday — possibly out to Hurricane Sound. 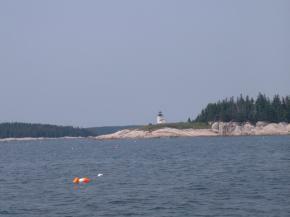 From Bass Harbor on Blue Hill Bay, we took the Southern passage around Swan's Island to the North and Long Island to the South and up through Toothacher Bay into Jericho Bay. 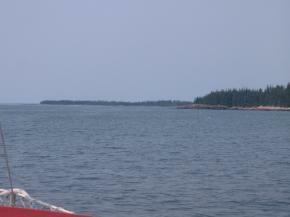 There are two passages from Jericho Bay into Penobscot Bay that run between Deer Isle and Isle Au Haut: the Deer Island Thorofare and Merchant's Row. We chose Merchant's Row because it looked interesting and less traveled. We were not disappointed one bit in our choice, as you can see from the above series of pictures along the way. Unfortunately, due to our necessary heading, the wind was on our nose and we had to motor most of the way. Once through Merchant's Row, we threw up the sails and bore North on a brisk beat on the port tack headed for the Northern tip of North Haven. 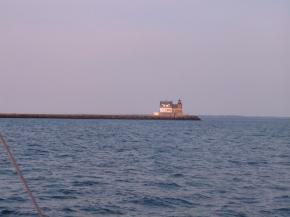 It was a very welcome sight as we pulled past Owl's Head and the Rockland Harbor breakwater lighthouse. 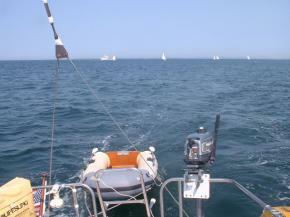 We motored slowly up to the mooring and tied off. We looked at each other and decided that cold beer was in order! Dan took the dingy and went ashore to take care of some business while I relaxed in the cockpit and watched the harbor activity. 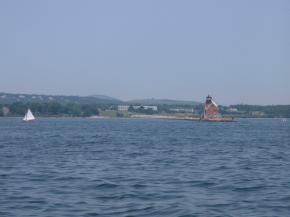 On the left is a shot looking back at the Rockland Harbor breakwater lighthouse as we headed into the harbor. 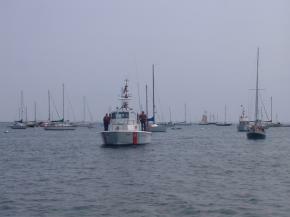 The picture on the right is a Coast Guard patrol boat headed into the harbor behind us. We took the dingy into shore about 9pm. We had heard that the new Black Pearl resturant on the harbor was good, so it was a no brainer to choose that. And we had a spectacular time! We got a great corner table and our waitress, Sarah, took very good care of us making sure we had an ample supply of beer and food. There was a good duo band and we just sat and talked and listend until we were some of the last folks there. It was almost midnight, and we decided that we should turn in after the long day we just had. So, we paid our bill, hiked over to the dingy landing, and hopped back onto Destiny. It didn't take us long to close up shop: the lights were out pretty soon after boarding. Another health food breakfast of donuts and in the light of day we decided that a hot shower would be nice. So we hopped in the dingy and took care of that. 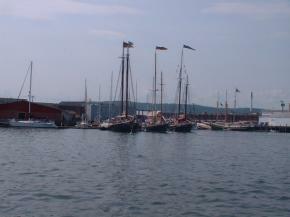 The Wooden Boat Show was packed with people. We got to see a lot of it for free coming off the moorage, though we were stopped a couple of times because we didn't have a pass sticker on our shirt. That shower was just what I needed, though I decided that shaving was not an option for a hardend beer swilling saltwater sailor. 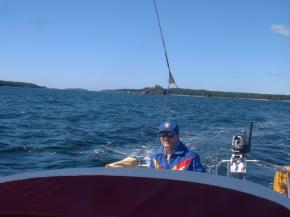 It didn't take us long after getting back to Destiny to throw off the hook and head for the open water of Penobscot Bay. On the left is another shot of the Rockland Harbor breakwater lighthouse as we headed out showing the Samoset Inn in the background (remember that the breakwater is three quarters of a mile long!). 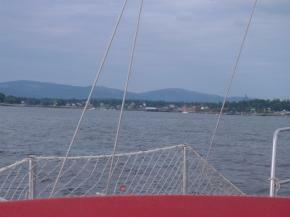 The picture on the right is a shot back into Rockland Harbor as we approached Owl's Head (which from this vantage point would be on the left). 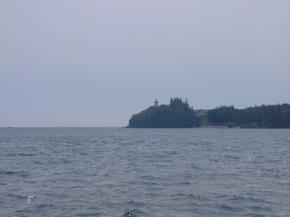 This picture shows us approaching Owl's Head light. Close in, the water was calm with just a nice 10 to 12 knot wind blowing. We set Destiny on a fairly close beat to the Southeast toward Hurrican Island. We thought we'd skip down there and see what was up and if there was enough time, we could get out onto Hurricane Island as Taft's guide said there was a lot of interesting things to see regarding the Hurricane Island Outward Bound program. As we were getting a fairly late start to our trip, we broke out the last of our sandwich stuff and had lunch. It was an easy course: the only thing we had to watch out for was a red nun marking some sholes off the Southern tip of the outter islands of Hurricane Sound. As the sky was clear, we could easily pick out the nun from a distance and so just kept Destiny's nose pointed a little South of that. We had been listening to the marine weather as we could see some uncertain cloud formations building to the far North. Unfortunately, there was a chance of thunderstorms possible for the afternoon. As it was already arouund 2pm, we felt we could not afford to enter Hurricane Sound or get off the boat. We had pretty much had our thrill ride for the trip the afternoon before. Though it did not rain, it didn't matter because of the terrific time we had just sitting in the cockpit drinking beer and watching the magnificant parade of wooden boats go by. We must have spent several hours on deck. 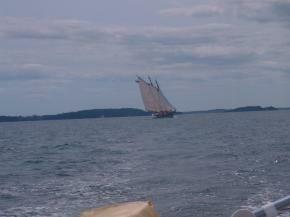 I took a lot of pictures, some of which were good enough to save to give a feeling for the harbor activity. Many of these can be seen by clicking this link.